Too often problems under saddle are thought to be behavioral in origin leading to inappropriate training, selling and potential euthanasia. 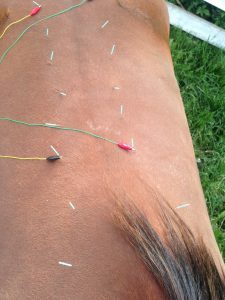 The addition of alternative modalities including acupuncture for diagnostic and therapeutic measures in such horses is an affordable, potentially lifesaving practice that should be incorporated in the work up of such cases. History: Max, an 11-year-old Tennessee Walker presented with three-year history of moderate to severe back sensitivity since purchase. History prior to purchase is unknown. Moderate improvement was noted with chiropractic work, massage, and further training/desensitization. However, he remained sensitive to touch as well as reactive under saddle, which included crow hopping, stiffened gait and anxiety, until warm up commenced. Pleasure riding with infrequent use. Myofascial Exam: Significant bilateral hyper aesthetic and withdrawal response to gentle palpation of the caudal thoracolumbar epaxial and juxta-vertebral muscles. Strong withdrawal response during attempt to palpate lumbar musculature. Moderate bilateral hyper aesthetic reaction along mid-caudal thoracic ribs and epaxials. Mild bilateral tension around withers and shoulder (BL 13-18, SI 11-12). Left shoulder more developed than right. Trigger point present over left cranial brachiocephalic muscle along bladder line. Lateral flexion of the thoracolumbar spine was not able to be assessed due to reaction present to basic palpation. Assessment: Severe myofascial tension and musculoskeletal pain located within the caudothoracic-lumbar region with mild symmetrical atrophy of the gluteal muscles is suspected from reduced use and engagement. Suspected compensatory soreness and overuse of the frontend is present. Variance between the left and right shoulders potentially could relate to handedness of the horse or further compensation. Focal pain present at Bladder 23 could relate to gastric ulceration, however, minimal supportive clinical signs have been appreciated. Saddle fitting evaluation revealed a narrow tree and short skirt applying pressure along the inner and outer Bladder line with tenderness to Bladder 18-21 appreciated. Differential Diagnoses: Supraspinatous ligament desmitis, over-riding dorsal spinous processes, old fracture with persisting osteoarthritis and associated soft tissue injury, and/or poor saddle fitting. The owner wants to provide increased comfort for her horse with hopes for gentle trail riding. Further diagnostics such as ultrasound, x-ray or nuclear scintigraphy is not an option. Therefore, pain relief due to myofascial and muscular release as well as reduction of compensatory stiffness with the end goal of improved tolerance of back palpation and work under saddle is the goal for our treatment. Acupuncture Treatments: Treatments were 1 week apart for three treatments. Owner was instructed to have passive rest for 24 hours prior to return to slow ground work including stretching. Electrical Stimulation Unit used was a ITO ES-130. Reasoning for each point is included in brackets. 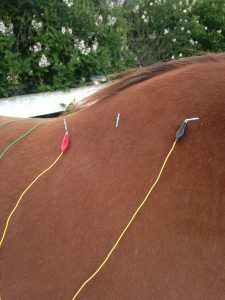 Treatment 1 (June 5th, 2017): Due to the horse’s extreme intolerance to palpation a dry needle treatment focused on parasympathetic stimulation and anxietolytic properties were pursued with local points at a smaller gauge with minimal stimulation. .20X30mm Asiamed needles used with exception of BL 10 (0.16X15mm asiamed). Points placed included: LI 16 (anxiety), GB 21 (muscle tension and desensitization – first point placed), GV 14 (neck and back pain), Bai Hui (back pain), Bl 10(local tension),Left side SI 12, 11 (myofascial release), BL12(local and regional pain), BL13(local pain), BL15(local pain/anxiety), BL 18(local pain and myofascial release), BL 21 (TL pain and myofascial release +/- mild gastric ulceration (undiagnosed), BL 23 (Local and lumbar pain), BL 25 (caudal lumbar/sacral pain and myofascial release). Minimal stimulation was pursued this treatment. No electrical stimulation was used. Horse was hesitant but tolerable with drastic relaxation of temperament and mild reduction of kyphosis and piloerector noted following cessation of treatment. Minimal improvement in gait appreciated. Treatment 2 (June 13th, 2017):Re-evaluation revealed increased tolerance to back palpation with minimal piloerector of the caudothoracic-lumbar region present. Gait similar in appearance. Similar treatment was pursued as above with addition of: BL 11(local and regional tension), TH 16 &SI 16 (cranial neck pain) and electrical stimulation between BL 18 ->25 then BL 21->BL 25. Electrical stimulation – 4 frequency with approximately 3 Hz/lead determined by slow increase until fasciculation was noted at which time frequency was reduced slightly. Each treatment was pursued until adequate relaxation (determined by reduced grab) was appreciated. Each treatment was approximately 10 minutes in length. Treatment 3 (June 21th, 2017): Owner has noticed significant improvement in ability to brush and touch horse’s caudal back. Work under saddle has not been pursued. Owner has continued with ground work including stretching. Able to gently palpate the entire back without withdrawal. Tension in left cervical spine minimal. Treatment 2 applied with 0.25X40mm Asiamed needles with exception of BL 10. BL 11, TH 16 and SI 16 were not used as previous tension was no longer appreciated. Insertion of large bore needles was well received with minimal fascial tension appreciated. Electrical stimulation was pursued and well received with relaxed disposition including dropped head and lip licking by end of treatment. Gait following contained more action and engagement of the hind end. Kyphosis no longer appreciated. Outcome & Discussion: Overall, despite lack of western diagnostics the improvement in the disposition, ability to palpate and interact with Max’s back and slight improvement in gait following three treatments was well received. As a definitive diagnosis was not obtained I highly suspect maintenance treatments will be required to keep Max comfortable. The owner has switched to a more appropriate saddle with a wool pad and plans to start riding walk trot with straight collected work and over rails to help engage the hind end now that soreness has been alleviated. This is a fulfilling case for me as much too often horses are punished, sold, and disregarded due to “behavioral” vices with many originating from undiagnosed pain. Ideally further western modalities could have been pursued, however, I hope that with the newly established relationship further diagnostics can be done in the future.